This fall, Greater Grand Rapids Bicycle Coalition members, friends, and supporters will ride 300 miles in support of a safe cycling community, sustainability, and GGRBC's Room to Ride campaign. 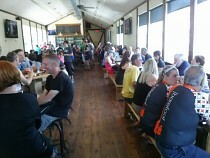 Gather your friends and ride down to Rockford Brewing Company for an opportunity to meet the diverse group of riders who make up Team GGRBC. You'll have an opportunity to learn more about the first-ever Climate Ride Midwest and support the rider(s) or your choice -- or the team as a whole. A very special THANK YOU to Rockford Brewing Company for generously offering to donate $1 for every beer sold to Team GGRBC. Enjoy a delicious cold beverage in a casual setting: It's such an easy -- and fun -- way to support a great community cause. About Our Fundraising Goals: Each rider on Team GGRBC is charged with raising $2,800 in order to complete the ride. Our team has an overall goal of $17,000 and we hope to meet and surpass this figure. A majority of these funds -- a minimum of 60% -- goes right back into GGRBC to support the work we do with our Room to Ride campaign, an initiative to secure 100 miles of bike lanes in Greater Grand Rapids by the end of 2015. Your sponsorship of Team GGRBC will have a direct impact in making Grand Rapids a safer, more economically robust, sustainable, and healthier community. About Team GGRBC: The roster includes Bruce Allen, Amanda Bruehl, GGRBC Board Member Jay Fowler, GGRBC Board Member Jon Miner, GGRBC Executive Director Tom Tilma, and Jim Winter-Troutwine. Our team members are united by a belief in the work of GGRBC and their desire to make Grand Rapids a better place to live. We are still accepting cyclists to join our ranks. Click here to sign up. About Climate Ride Midwest 2014: Climate Ride is a national 501(c)(3) non-profit organization that organizes life-changing charitable events to raise awareness of key issues while also supporting sustainability, active transportation, and environmental causes. Climate Ride events raise critical funds for a number of non-profit and charitable organizations throughout the country. The first-ever Climate Ride Midwest is a fully-supported event taking place September 6-9, 2014. Other Climate Rides include Climate Ride California Wine Country and Climate Ride NYC-DC. Please contact GGRBC Development Coordinator, Tricia Boot, at [email protected] for questions about Climate Ride Midwest 2014, GGRBC or our team.